I made this recipe for last week's Fury BBQ. I was supposed to make potato salad, but I woke up to a grey and rainy morning and it filled me with tiredness. I thought about turning on the stove and thought I can't. It was one of those days. So what can you do, Munt? I can stay in bed and watch twelve hours of SVU. Come on, can you stop by the grocery on the way to the barbecue, which don't think you're not going to. Has it come to this? I've never brought bought potato salad to a party before. Ha well, you did bring a package of bacon to Ska's Fury brunch. THAT WAS BRILLIANT, EVERYBODY LOVES BACON. Well anyway, I was thinking about guacamole. 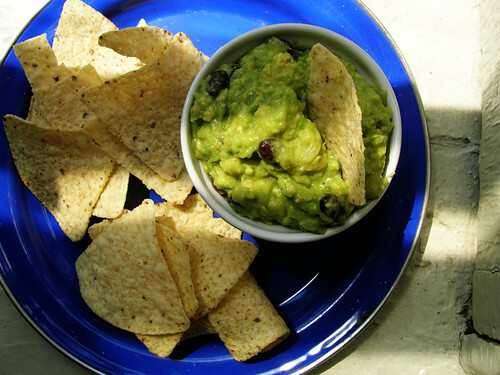 Everybody loves guacamole. I'M NOT CHOPPING TOMATOES. I will think of something different, everything will be in a can. So then I had just one last hole in my blog planner before break, I was thinking I didn't have any new recipes and then in a flash I remembered this guacamole. I had to make the whole party-size recipe again for the picture, today is beautiful and sunny and the sweetie man and I are eating guacamole to our heart's content. Halve, seed, and peel the avocados and mash them in a large bowl. Mash in the salsa verde. Rinse and drain the black beans, and mix them in. Add the crushed pineapple by the forkful to taste. I like about three-quarters of the can, enough to definitely taste the pineapple, and by the way I use a fork to slightly separate the pineapple from its juices. Then I use the fork to eat whatever pineapple's left in the can.